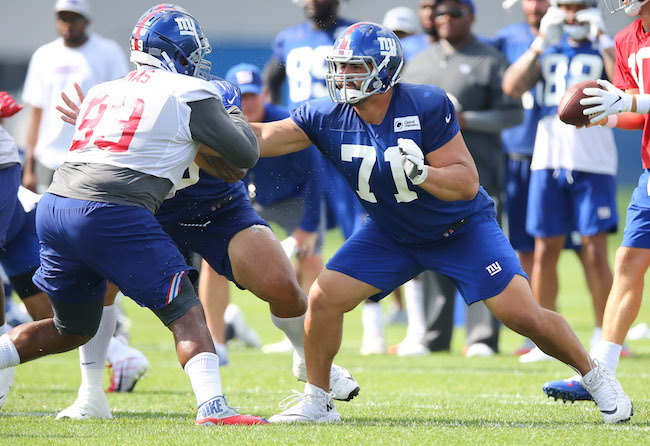 The New York Giants held their fifth full-team summer training camp practice on Monday at Quest Diagnostics Training Center in East Rutherford, New Jersey. The complete training camp schedule is available at Giants.com. Not practicing on Monday were cornerback Donte Deayon (hamstring), running back Jonathan Stewart (unknown), defensive lineman R.J. McIntosh (unknown – Active/Non-Football Illness list) and tight end Garrett Dickerson (hamstring). Safety Curtis Riley and linebacker Avery Moss left practice early with an unknown leg injuries. There was a heavy focus on the running game today at practice. In 11-on-11 drills, linebacker B.J. Goodson clobbered running back Wayne Gallman in the backfield. Running back Jalen Simmons ran over linebacker Calvin Munson. Tempers flared after linebacker Olivier Vernon hit running back Wayne Gallman hard after he caught a swing pass and Gallman threw the ball at Vernon. Cornerback Kenneth Durden made a couple of plays, including a diving interception in the end zone. Wide receiver Odell Beckham, Jr. made a touch catch on the run in traffic and scored in red-zone drills. Quarterback Eli Manning found wide receiver Sterling Shepard for a touchdown in the red zone. Manning completed a lot of short, high-percentage passes today. Returning punts were wide receivers Kalif Raymond, Hunter Sharp, Sterling Shepard, and Odell Beckham, Jr. Tight end Jerell Adams beat linebacker Romeo Okwara down the seam for a catch. Wide receiver Amba Etta-Tawo made a nice catch over cornerback Grant Haley. Wide receiver Odell Beckham, Jr. beat cornerback Eli Apple one-on-one along the sideline and turned upfield for a long touchdown. Overall, Apple had a solid day in most 1-on-1 situations however. Jordan Williams had back-to-back sacks. Wide receiver Travis Rudolph caught a pair of touchdowns. A scuffle broke out between offensive lineman Jarron Jones and defensive lineman Kristjan Sokoli. Wide receiver Kalif Raymond was the first one to return kickoffs at practice. Linebacker Olivier Vernon and left tackle Nate Solder practiced one-on-one after practice was over.